Orange and whole wheat is a natural combination, and these feathery pancakes make a complete breakfast. They're so light it's hard to believe they're made with whole wheat flour. 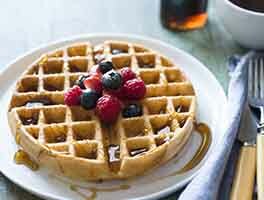 Eat them as soon as they're made, topped with maple syrup, and begin your day with a full tummy and enough protein to last you until lunch! Place the cottage cheese, egg yolks, melted butter, and orange juice in a food processor or blender, and process until the cottage cheese is smooth, about 30 seconds. Add the flour, sugar, salt, and cinnamon, and process again. Scrape the mixture into a medium bowl and stir in the orange zest or extract. Let this mixture rest for 10 minutes. In the bowl of your electric mixer, whip the egg whites until they're stiff but not dry. Use a rubber spatula to stir a spoonful of the whites into the batter to loosen it, and then gently fold in the rest of the whites. This batter doesn't need to rest; cook the pancakes right away. Lightly grease the griddle. When a drop of water skitters off the griddle, it's ready to use. Pour the batter in 1/3-cupfuls onto the preheated griddle. Cook the pancakes until golden brown on both sides. Serve immediately; they don't hold well in the oven. These were very good and I like that they had a little protein in them due to the cottage cheese. I did not feel that the orange flavor was overwhelming at all. Just a hint of orange. My normal pancake topper is that I like to thinly slice apples, saute them in a little butter and add 1/4 tsp cinnamon, 1/4 c orange juice and 1/2 cup maple syrup . I cook it down just a few minutes and use this as a pancake topper so that we are using less syrup (fewer calories) and getting some fruit. It went really well with these pancakes b/c the tie in with hint of oj and cinnamon in the batter. My one complaint about this recipe is that it dirties a lot of dishes in the process. 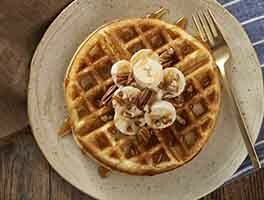 Because of that and that they take a little more time to get them to the table, I won't make this recipe as often as the KAF Belgian waffle recipe. You can quickly toss the ingredients for those together the night before and have a fluffy pancake quickly in the AM. If you do make that one, the conversion isn't listed right after the recipe. I found it listed in one of the reviews. A KAF baker replied and gave the conversion. 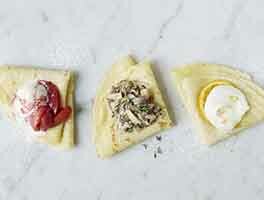 "Becca, to make this recipe as pancakes, simply reduce the butter to 3 tablespoons instead of 6. Feel free to add 1-2 additional tablespoons of milk if the batter seems thick. Portion onto a hot griddle as desired to make beautiful, golden pancakes. Kye@KAF"
These pancakes are very light and fluffy. I loved them. The kids, however, didn't like the orange flavor nor the texture. They prefer sturdier buttermilk pancakes. Yummy and full of protein! Not only does it have a good amount of cottage cheese, but also a good number of eggs :) These are simple to make; my food processor was a mini so I placed all ingredients in processor EXCEPT the flour and egg whites. Weighed the flour into a medium size bowl and gently stirred processed ingredients into flour and then the egg whites as directed. I made a batch and a half and they were all eaten up by 4 family members. Though I did not count how many pancakes for an exact yield I would estimate at least 18, four inch pancakes in my 1.5 batch. 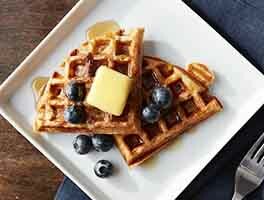 These are great with maple syrup and compliment fresh berries and peaches nicely. As indicated - they do need to be eaten right off the griddle. These are my absolute favorite pancakes! Please make them. This recipe makes the most light and fluffy pancakes. I used a shaped pancake pan to cook them and they turned out just great and they cooked up pretty quickly, I turned them over as soon as I saw the slightest bubbling. I topped them with honey butter, a dollop of whipped cream and dusted slightly with cinnamon/powder sugar. My two boys didn't leave one bit on their plates. This recipe will definitely be in the breakfast rotation. 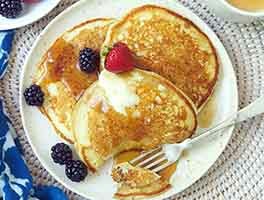 These pancakes are so light and flavorful! I did not have cottage cheese. I substituted ricotta. Delightful. Quick and easy.